The smell of freshly sharpened pencils permeates our home. Books are already scattered across the kitchen table, and I actually got up before the kids. 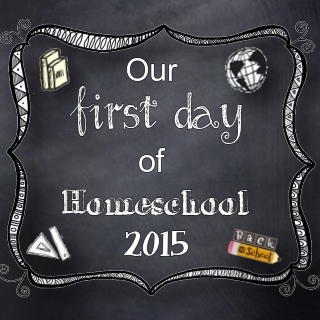 In our home, this can only mean one thing – our homeschool year has begun. I have spent the past couple of weeks going over my yearly goals and objectives for each of the little ones. My oldest son was much more hands-off as all but two of his classes are being done via dual-credit classes at our local community college. Beccaboo would be considered a 1st grader this year, and Carebear will be doing Kinder work. I have broken our day into two parts to allow the kids some free time in between. This is our basic morning schedule. I have a feeling I am going to have to add something between journaling and math for Becca. She struggles with book work so a break with some manipulatives or reading might be needed. We’ll test it out for a couple weeks and see how it goes. Becca was very excited about the unit study of the week. We have dozens of boxes from BabbaCo that I will finally get to use. Our first week is Animals. We picked that theme specifically to match Becca’s book club theme. I suspect we’ll read between 15-20 books all about animals this week, and I’ll let her choose her favorite to share with her friends at book club next week. Caleb will be starting with the Letters of the Week Curriculum from Confessions of a Homeschooler. I put these binders together two years ago. It was quite an undertaking because I printed everything, laminated most, and then organized it into binders by letter. We’ve used them lots over the past two years, but this will be our first official year of using it as a curriculum instead of just as a supplement. It is $15 for her entire LOTW curriculum. It’s over 1,000 pages of quality printables, but you can pick and choose what you want to use. My kids particularly like the do-a-dot pages, the magnet pages, the graphing worksheets, and the poke pages. Their least favorites are the pattern pages which are much too simple and the puzzle pages. 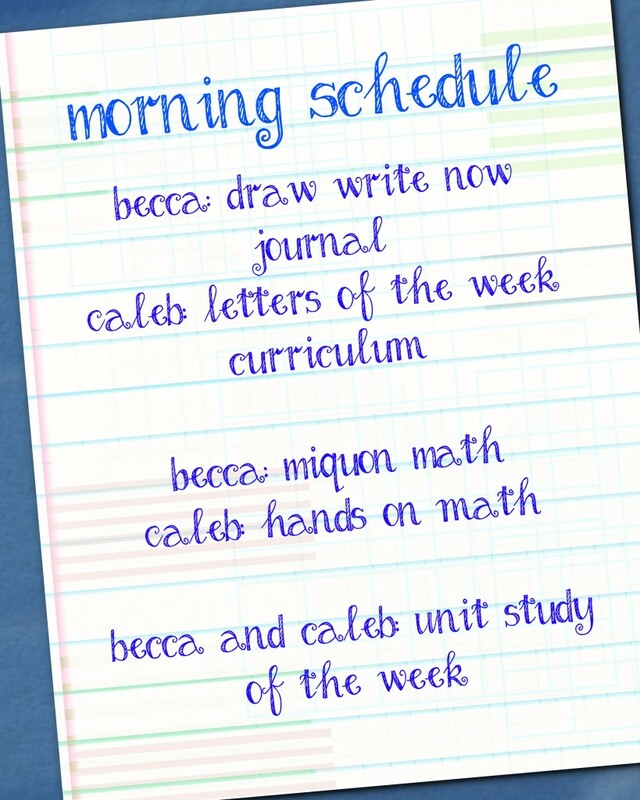 For math, Becca is continuing with Miquon and Caleb will work alongside her using the same manipulatives but not doing any workbook writing. We’ll break for lunch and for some afternoon fun and pick up later with an afternoon schedule. Becca continues with Explode the Code this year. She did books A, B, C, and half of Book 1 last year and she’ll continue this year. 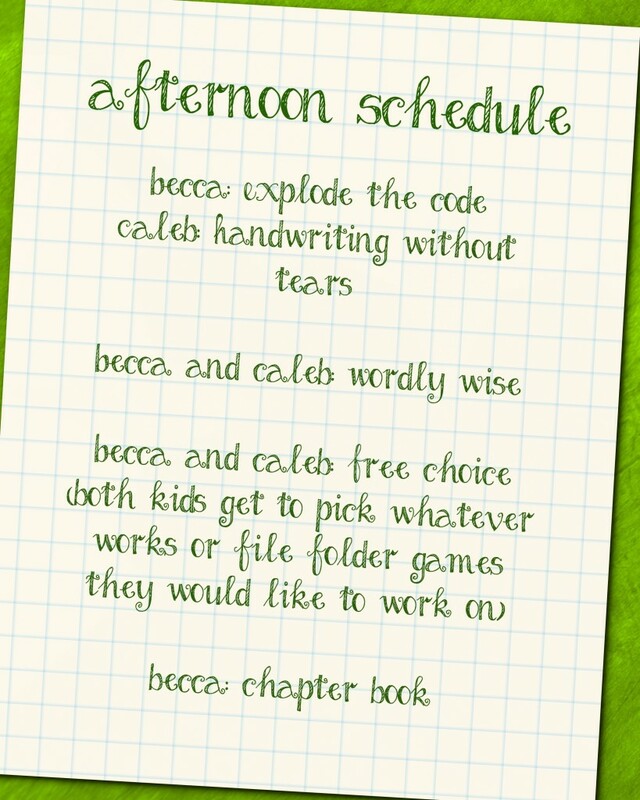 While Becca is working on that, Caleb will finish out his Handwriting Without Tears book. He’s already to X in the Primer book so he’ll be moving on quickly. After we finish with those, they get to pick out what they want to do from our many file folder games or our shelves of works. Have I shown those to you all? These two huge bookshelves take center stage in my kitchen of all places, about two steps away from my desk. They are filled from top to bottom with fun stuff for the kids to work on or with. The file folder games are around the corner in one of those wall-hanging file folder organizers teachers use in classrooms. 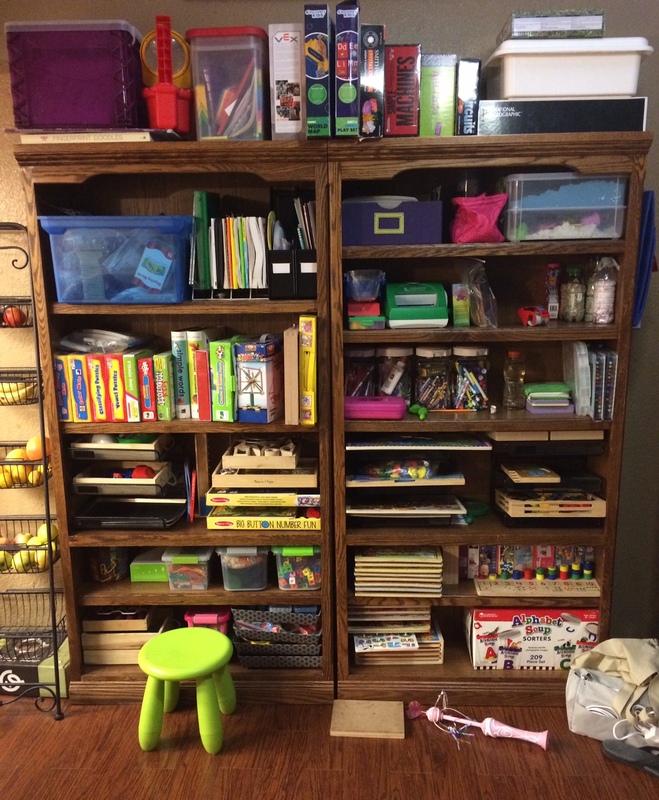 I have it right down at the bottom of the wall so the kids can easily pull out and put away any of the folders. After we finish with the free work, Becca and I sneak to the living room to read a chapter book. It’s one of my favorite times of day. That’s our day in a nutshell. Day 1 was successful in that we got everything done, but it was a bit of a battle. Becca definitely dug in her heels about doing those workbooks. By about 3 PM, I was ready for a margarita or a nap. But, we pushed through. Once they get used to the routine again, it will go more smoothly.